In the past, the music industry had several sources of revenue – record sales, music licensing, radio royalties, live performances and more. For “larger than life” pop stars, product endorsements in advertisements became a huge source of revenue – one that record labels started to capture some of through “360 deals” (deals structured in a way that allow record labels to earn a cut of some of the non-music related activities of their artists). In the late 1990s, with the advent of Napster and Audiogalaxy, music piracy reached dizzying heights and record labels saw a dramatic free-fall in terms of revenue. The industry had been turned upside down. Copyright lawsuits were not an effective means to squashing piracy. The incentive for anyone to pay for music had disappeared almost overnight. Legal options for buying single songs emerged in 2004. Unfortunately, the low price point of a $1 (now $1.29) per song almost “commoditized” music. Low price points are typically associated with something that has either minimal or diminishing value. But music has not really lost its value has it? Piracy dramatically reduced the profitability of the music industry but it did not lead to its demise. While the music industry lost one of its primary sources of revenue, it became obvious fairly quickly that there was an element of “price inelasticity” in the minds of many music consumers when it came to “music experiences” – primarily because it was impossible to pirate the music experience. So far, record labels and the world at large have equated music experiences to live concerts. The price of concert tickets skyrocketed soon after the music industry’s free-fall in the wake of digital music piracy on an unprecedented scale. Fortunately, for the industry, the appetite for live music had not diminished and people (while aghast at concert ticket prices) did not seem to think twice when it came to making a purchase decision around concert tickets. Furthermore, there has also been a growing trend of music aficionados traveling abroad to watch some of their favorite artists and bands in concert. But is the record industry leveraging their assets (i.e. the artists) to the best of their ability? We do not think so. Live concerts constitute a very limited definition of what qualifies as a “music experience”. In our humble opinion, music experiences could include attending recording sessions, attending concert rehearsals, attending a mixing session, attending a private live streaming event for an artists, or a google hangout with the artists and die-hard fans. The one music experience that die-hard fans of an artist or band would kill for is a preview of a new album by their favorite artist or band. In the past, such events have been limited to a selected list of music industry professionals. There has been a cloak of exclusivity around such events. Exclusivity and scarcity drive value (that’s just basic economics!). If fans were allowed to pay to attend such events, would they – and if they did, how much would they pay? a. Duran Duran is far more than a band. They are a multi-faceted music brand that has evolved dramatically over a career spanning more than 30 years. They were the faces of MTV’s “music video” era. They were the pioneers of the “location shoot” for music videos. They came back against all odds in 1993 with a new sound at a time when artists from the 80s were being shunned by the mainstream. They represent a tenacity and commitment to the art form of music that is relatively unparalleled. Last, but not least, they are poster-children for musical longevity. b. For this new album, the band has signed a global recording contract with Warner Music. In a music industry with a fairly overt ageist bias, it is practically unheard of for an artist (that is not Madonna) to sign a major label contract in his or her 50s. Record labels are the venture capitalists of the music business – a business that continues to lose money. They only invest in acts that they think are commercially viable. c. A snippet of the band’s new single “Pressure Off” (featuring Janelle Monae) surfaced not too long ago. If that snippet is any indication of the rest of the song, it just might be 2015’s “single of the year”. This might speak to point that we made about commercial viability earlier. In a year of lackluster pop singles, there are some promising signs that this veteran act just might save pop music in 2015. As of 11:40 pm on June 10, the highest bid is $1600. It would be very interesting to see what this number increases to. This is not something that only Duran Duran fans should monitor. This is something that the entire industry should watch closely as they watch a real life experiment in evaluating “price inelasticity” of a pre-release “album preview” event. From a record label’s perspective, this is an easier event to stage in comparison with a live concert. While this event is a charity event, it is a fair assumption that the value that fans associate with such events will not diminish even if the event is a “for profit” event. Such an event could be yet another avenue for record labels to recuperate from the loss of revenue to severely diminished record sales. Is this the beginning of a wider trend? Only time will tell. 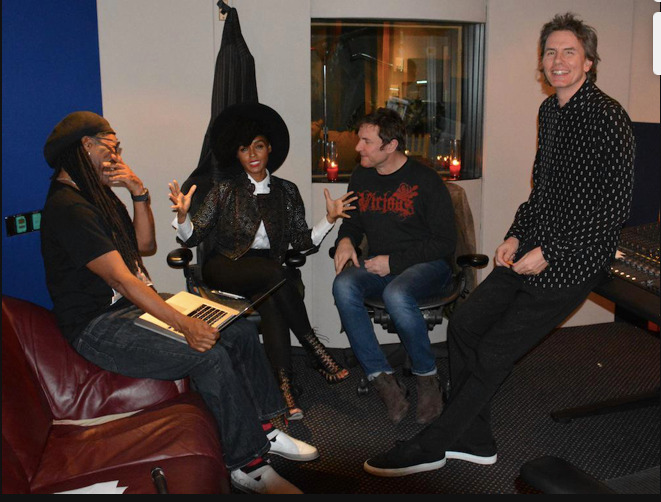 We are thrilled that Duran Duran is back doing what they do best. This event is yet another manifestation of the fact that these guys are poster-children for class, talent, sophistication and tenacity. We are an American internet radio station that broadcasts worldwide. The station features an eclectic mix of current pop and rock music from both sides of the Atlantic alongside hits, forgotten gems, and rarities from the last three decades. The music of Duran Duran (both old and new) is a regular staple on our radio station. In fact, we play plenty of newer music by bands that rose to prominence in the 80s. Noteworthy examples include Tears For Fears, a-ha, Spandau Ballet, INXS, Depeche Mode, Johnny Hates Jazz, Simple Minds, and Culture Club. 2 Responses to "Duran Duran’s “album preview” charity event could herald a new revenue source for record labels"
Interesting article! Duran Duran is amazing and is really on the cutting edge of the future. I have mixed feelings. I think it’s cool on one hand but I worry that it is too exclusive, that certain bands will only be for the ultra rich and will limit themselves to just a clique of super fans. I like music to be more universal. PJ Harvey did a thing where fans were able to buy tickets to see her record her new album. So there’s another example. @Frannie: For this article, we wrote it from a shamelessly capitalistic perspective. This is without a doubt very exclusive and rewards the rich opposed to the person that necessarily values the event. Maybe a portion of tickets for such things can be cash-based and others can be “loyalty” based – wherein fans get loyalty scores of some sort. These loyalty scores can be a function of the fan contributing to the band’s social media footprint. These days, it is quite easy to figure out what fans are boosting the profile and awareness of their favorite bands. Thank you for the PJ Harvey example. I am actually hoping more folks post more examples here in the comments section.